When I was in high school my mom was diagnosed with skin cancer. Luckily she made a full recovery (thank goodness!!!) but the experience instilled in me the importance of sunscreen. Let’s face it: We all know that tanning is bad, but so many of us still do it. Why? Tan skin looks good. It make you look more toned and it hides skin imperfections. Not to mention how great a tan looks against white clothing! If you love the way a tan looks, I urge you to save your skin and fake it! 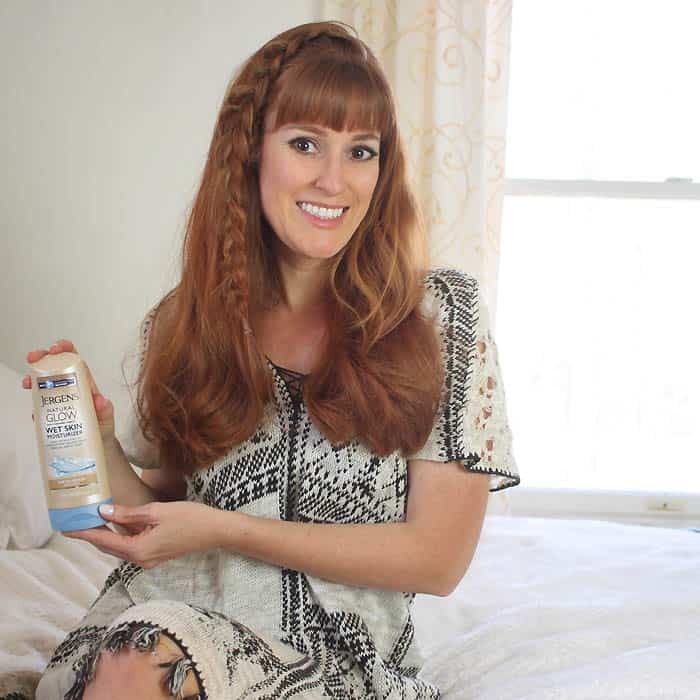 Going the sunless route when you’re a pale skinned girl can present some challenges, so I’ve partnered with JERGENS® Natural Glow® to share with you my 5 Ways to Fake the Perfect Tan. 1) Choose a Great Product! I’ve been using JERGENS® Natural Glow® products for years. JERGENS® Natural Glow® Wet Skin Moisturizer allows you to build up color gradually. The fair to medium color if perfect for us pale girls. The color is very natural. Your skin will look a few shades darker. 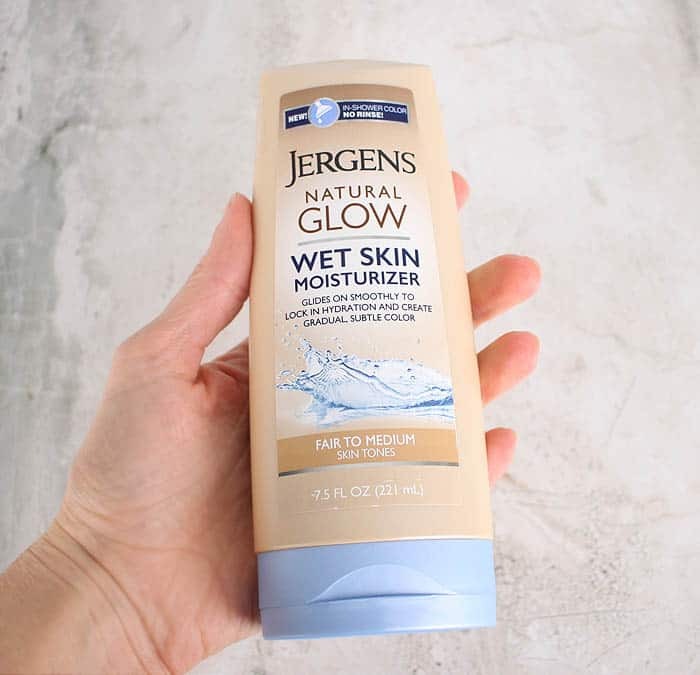 If it’s still too light for you tastes, you can apply the JERGENS® Natural Glow® Wet Skin Moisturizer again the following day. Since my skin is so fair, I re-apply it every 3 days to maintain a realistic glow. If you want a faster way to tan, look no further than JERGENS® Natural Glow® Instant Sun® Sunless Tanning Mousse. You can immediately see the color and it dries in 60 seconds! I’ve reached for this numerous times when I’m getting ready in the morning and I’m feeling a little too pale. 2) Exfoliate before first use. This helps to get get a more even tan. The lotion will absorb better and it makes your skin feel so soft! 3) Watch out for tricky areas like knuckles, knees, ankles and in between fingers and toes. Use a very small amount on these areas. Since the skin here is thicker the color will absorb more and turn out darker than the rest of your body. Make sure to smooth the lotion on evenly and thoroughly. 4) Wash your hands thoroughly when finished or use a self tanning mitt. The palms of your hands don’t tan so be sure to wash all the product off before it dries! Apply the lotion in sections (arms, legs, torso) and wash hands as you finish each section. 5) Wear sunscreen! You may look tan, but your skin can still easily burn. Apply a broad Broad-spectrum protection sunscreen with a SPF of 30 or higher. Do you guys sunless tan as well? I’d love to hear any of your tips! 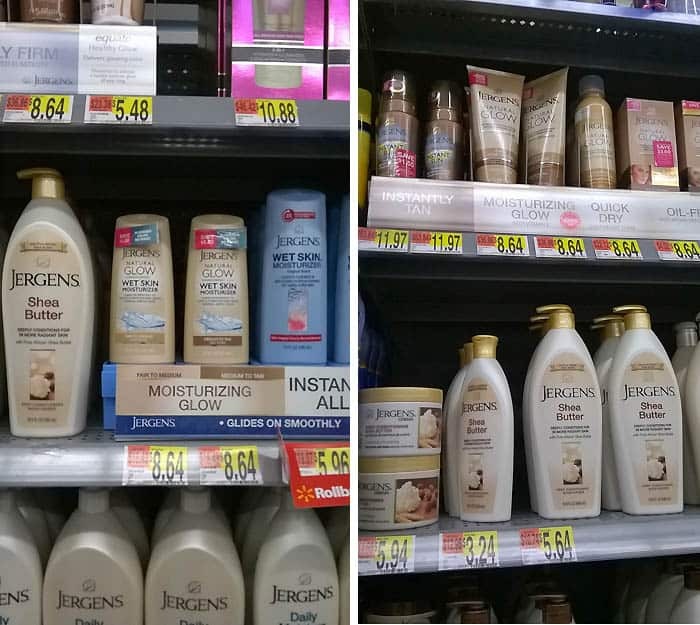 Walmart carries a wide selection of JERGENS® Natural Glow® products. 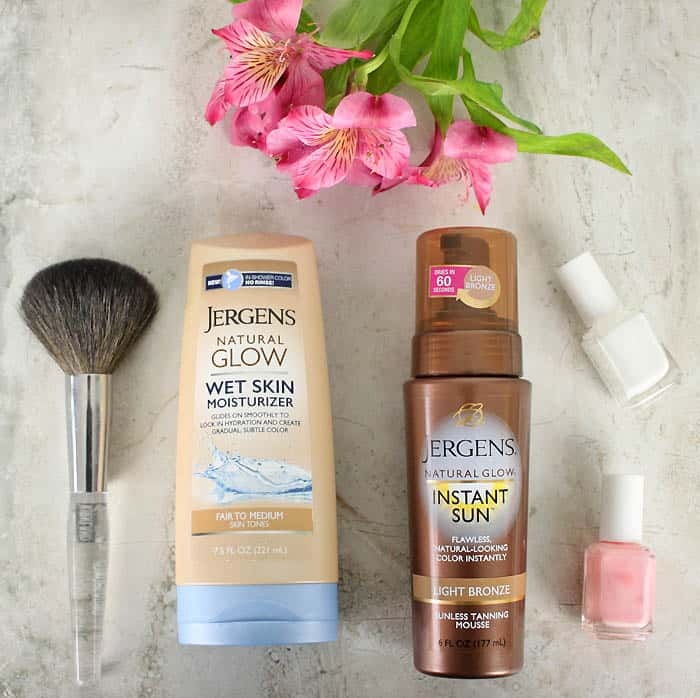 JERGENS® Natural Glow® Wet Skin Moisturizer is in the Body Lotion aisle and JERGENS® Natural Glow® Instant Sun® Sunless Tanning Mousse is located in the Sun Care aisle. I'm going to have to try this. I'm fair too. Your tan looks so natural! Im gonna try this! Your tan looks really natural. json formatter – edit and format JSON.